Публикация компании ООО "Би-оН ЭМГ" в IntechOpen. 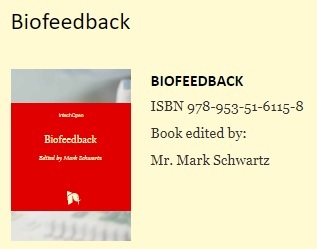 Книга Biofeedback by Mr. Mark Schwartz. "The LLC “Bionic Natali” company is a startup and has been engaging in creation of bionic artificial limbs of hands for more than 2 years, and the LLC “Bi-oN EMG” was created one year ago on base of LLC “Bionic Natali”. From the first steps, projects had been directed on the solution of a problem of development of the domestic bionic functional artificial limb of the hand based on neural network and others algorithms. In projects, it had been created the functional system of management, system of tactile feedback, which has increased controllability of a functional artificial limb, which is already realized and integrated, and also the functional bionic artificial limb of the hand. On the basis of this work, the general representations and practical application of training of machine, neural network and other algorithms have been made. The technology of recognition of gestures of electromyographic activity based on neural network or an analog of network remains a cornerstone. The bracelet is placed on a hand (in case of disabled people, a stump), further nondestructive electrodes delete potential difference of neuromuscular action; by means of an electric circuit there is data handling and their transmission to the processor where by means of a neural network there is a recognition of the gripper, further data are transferred for control of a bionic hand. This technology has also found so far mostly theoretical management, but undergoes testing practical, for control of the knee module of a bionic artificial limb of the lower limb. The technology of bracelet became the product of LLC “Bi-oN EMG” for virtual reality, games and rehabilitation. On the basis of this researches the important conclusion has been drawn: after carrying out operations within rehabilitation and the subsequent use to establish to the recommendation immediately bionic artificial limbs as eventually without trainings and also because of psychology of people "experience of management" the hand is lost, and without trainings of the muscle atrophy. But restoration is possible, alas, it will demand much more time, than in cases of immediate prosthetics by bionic/myoelectric artificial limbs. The current researches have also shown the requirement of rehabilitation of disabled people before use of bionic artificial limbs of hands, in this regard, use of an electromyographic bracelet of LLC “Bi - oN EMG” will be offered as the option."